Imagine a childcare option where your little one gets to enjoy Annabel Karmel’s delicious home cooked recipes every day of the week…YUM we hear you say! Well, that’s just what our children at Kids Club Early Childhood Learning Centres are about to experience as Annabel brings her kids cooking know-how to Kids Club Centres. With hundreds of children in our care across centres in Sydney and Canberra, Kids Club knows how crucial it is for babies and children to stay fuelled on the right foods. Kids Club truly believes healthy nutrition is key during early education and have made it one of their 4 pillars. We also recognise the importance of introducing a diverse range of delicious flavours to encourage good, healthy eating habits for the future. 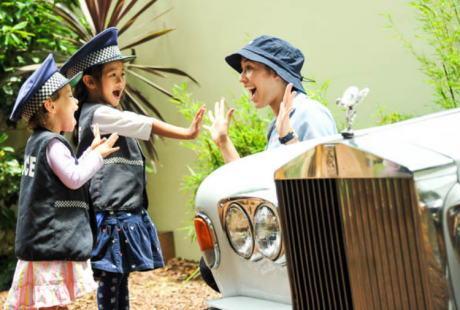 That’s why Kids Club Early Childhood Learning Centres have partnered with global children’s food expert and bestselling international author (with 45 cookbooks to her name) Annabel Karmel, MBE to bring a wealth of expertise and cooking know-how to our centres. Annabel is recognised all over the world for creating delicious, healthy meals for babies and children. 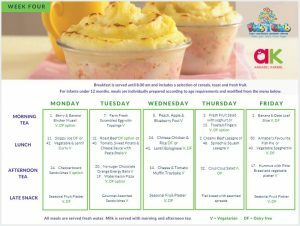 Closer to home, Annabel Karmel’s nutritious, tasty snap-frozen toddler meals range can be found at major supermarkets. Kids Club are raising the bar in early childhood nutrition collaborating with the “Messiah of mini-munchkin food” (!) 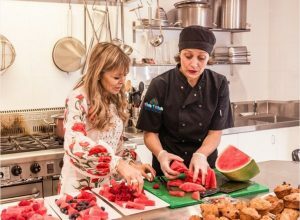 Annabel Karmel who is bringing a wealth of expertise and cooking know-how to our centres. Annabel Karmel has worked closely with the chefs at Kids Club to ensure mealtimes become an even better part of the day for our children. Dedicated to packing in plenty of goodness whilst ensuring mealtimes are anything but bland, Annabel Karmel has cooked-up a variety of appetising recipes that even the pickiest of eater will enjoy. 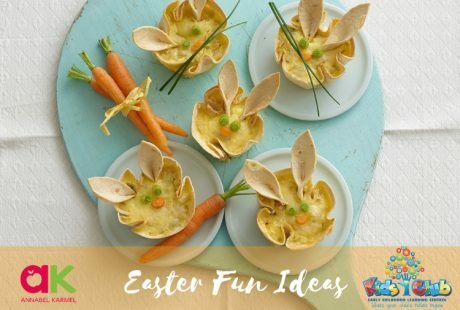 Catering for every food sitting, and catering for children with specific dietary requirements, the menu will enable children to experience everything from timeless favourites to yummy hidden veggie dishes and recipes that take a cue from a world of flavours. “From the opening of our very first centre we’ve strived to offer the best start to a child’s future from having the most creative play spaces to giving parents the peace of mind their little ones were receiving the best nutrition”. “Sally and I have five children between us and we’ve both used Annabel Karmel’s products in the past, I basically raised my two boys on her meals as I was a time poor, busy mum. Sally had used her recipes and mentioned how easy the meals were to prepare”. Annabel visited our Sydney centres and loved them! She took the opportunity to talk to our Chefs, prepare food for the children and answer some of our mums questions. With a career spanning more than 25 years, bestselling international author, global food expert and parenting influencer, Annabel Karmel MBE has pioneered the way families all over the world feed their babies and children. Since launching with her revolutionary cookbook for babies in 1991 – a feeding ‘bible’ which has become the 2nd best-selling non-fiction hardback of all time – Annabel has become a powerhouse within the food industry with 6 million books sold globally, menus in the world’s largest hotels and leisure resorts, bestselling apps and a vast digital following with millions of parents accessing her recipes and advice. Most recently, Annabel launched her Real Food Kids Will Love cookbook in Australia, filled with over 100 recipes for toddlers, children and the whole family. And when parents don’t have time to scratch-cook, Annabel’s award-winning snap-frozen toddler meals have become a go-to freezer filler among busy Australian households. Kids Club is an innovative provider of high-quality early childhood learning for children from 0 to 5 years old. Kids Club centres are raising the bar in early education, combining the highest educational standards with safe and unique learning environments. 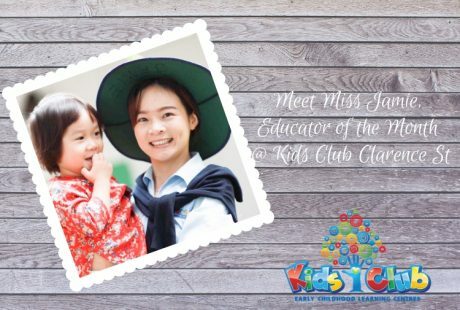 Kids Club has a team of passionate early childhood educators and teachers who deliver a loving, and challenging environment. They ensure that the play-based learning programs and amazing resources available are used to their full potential to create a healthy and fun experience for the children. Kids Club’s Education for Life is a holistic program aiming to develop the “whole child”. It is about giving our children the best start to their future, creating a passion and a life-long love and appreciation for learning.